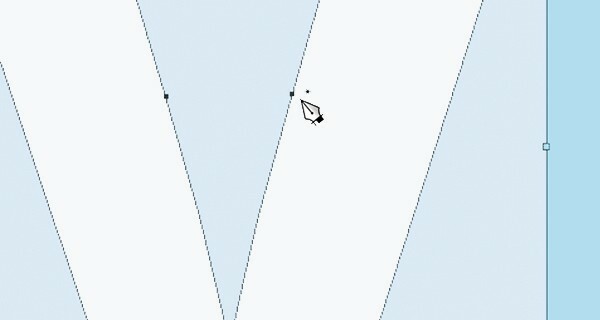 Home » Design » What the heck is a vector file? Below, to the left, is an example of a vector outline logo file. On the right, the same file is shown in preview mode in Adobe Illustrator. As you can see, all of the elements of the logo are outlined, including the font. Bitmap art files are rasterized, which means they’re made up of pixels. Shown below, left, is a bitmap logo file and on the right is an enlarged detail of it. As you can see, it’s made up of pixels. The most important thing to remember about vector files is that they can be reduced to the size of a postage stamp, or enlarged to the size of a billboard without losing quality. No matter what size, they appear sharp and clean. They also look better on devices (monitors and printers) with higher resolution. That’s why every business should have their logo created in vector format. Vector files are easier for computers to save and take up less space. They are created with points and paths, and based on mathematical formulas. Vector outline files can easily be converted to bitmap, but bitmap files can’t easily be converted to vector. That’s why logos should always be created in the vector format first. Most companies create their logos and brand graphics as vector art because of the ability to enlarge or reduce them without losing quality. Vector files allow for more flexibility across a wide variety of display devices. They can also be stored as the “master art” from which to convert files to JPG or PNG for the web. High quality graphic illustrations on stock image sites are often created in vector format. Whenever you have a choice of downloading vector or bitmap files from a stock site, always choose vector for more flexibility. Bitmap (raster) images are the preferred format for photos. When photos are taken with a digital camera the resulting files are bitmap. Encapsulated PostScript files (.eps) can be difficult for clients trying to determine whether the file is vector. Think of .eps files as packages that can contain vector, raster, or a mix of the two. Although vector files can be saved with the .eps extension, rasterized files can be saved that way too. Adobe Portable Document Format (.pdf) files can also contain a combination of vector and raster images. If a file was created in vector and saved as a PDF, it can be opened in a program like Adobe Illustrator and manipulated as needed. However, the file might have been saved as “uneditable,” which converts the art to bitmap. It can be hard to determine if an .eps or .pdf file is bitmap (raster) without opening it in a program like Adobe Illustrator to see. Below is a picture of a .tif logo that’s been placed in Adobe Illustrator, then saved as an .eps file. When this type of file is opened in preview mode there is only an empty box. The logo can’t be enlarged or manipulated like a vector outline file. 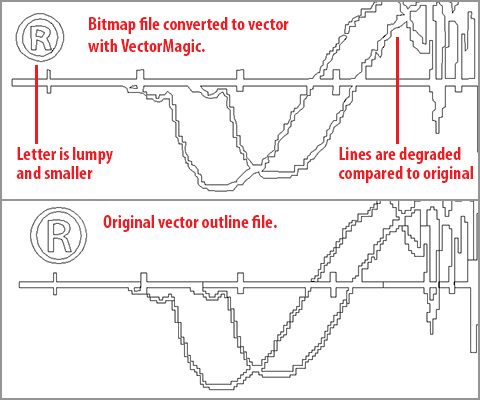 If you’ve determined that the file you have is bitmap but your printer needs vector, there’s a possibility of converting it to vector through Live Trace in Adobe Illustrator, or an online service like VectorMagic. However, there can be distortions as demonstrated by the comparison below. Although this might not matter if the logo is printing on a small ad, it can really look bad if the logo will be enlarged for, say, a sign. In conclusion, when creating logos and brand graphics it’s best to ask your designer to provide you with a vector outline file. This will allow for more size flexibility and better quality production. Make sure to ask your designer to convert all fonts to outline as well. If you need help with your logo design or creating vector art files, contact the Arion Group. We’d be happy to help.